This is a catalog for authorized resellers. If you don’t have a login, contact our sales team. EVO 3U 16 Bay SAN & NAS Server plus ShareBrowser Media Asset Management 32TB 16x2TB SATA, Unlimited ShareBrowser Licenses, Project Sharing for Avid/Adobe/FCP, 4x1GbE, 2x10GbE, Cloud Integration, 1YR H/W Maintenance, Lifetime Basic Support. Contact VDS for additional connectivity options. EVO 3U 16 Bay SAN & NAS Server plus ShareBrowser Media Asset Management 64TB 16x4TB SATA, Unlimited ShareBrowser Licenses, Project Sharing for Avid/Adobe/FCP, 4x1GbE, 2x10GbE, Cloud Integration, 1YR H/W Maintenance, Lifetime Basic Support. Contact VDS for additional connectivity options. EVO 3U 16 Bay SAN & NAS Server plus ShareBrowser Media Asset Management 96TB 16x6TB SATA, Unlimited ShareBrowser Licenses, Project Sharing for Avid/Adobe/FCP, 4x1GbE, 2x10GbE, Cloud Integration, 1YR H/W Maintenance, Lifetime Basic Support. Contact VDS for additional connectivity options. EVO 3U 16 Bay SAN & NAS Server plus ShareBrowser Media Asset Management 128TB 16x8TB SATA, Unlimited ShareBrowser Licenses, Project Sharing for Avid/Adobe/FCP, 4x1GbE, 2x10GbE, Cloud Integration, 1YR H/W Maintenance, Lifetime Basic Support. Contact VDS for additional connectivity options. EVO 2U 8 Bay SAN & NAS Server plus ShareBrowser Media Asset Management 16TB 8x2TB SATA, Unlimited ShareBrowser Licenses, Project Sharing for Avid/Adobe/FCP, 2x1GbE, 2x10GbE, Cloud Integration, 1YR H/W Maintenance, Lifetime Basic Support. Contact VDS for additional connectivity options. EVO 2U 8 Bay SAN & NAS Server plus ShareBrowser Media Asset Management 32TB 8x4TB SATA, Unlimited ShareBrowser Licenses, Project Sharing for Avid/Adobe/FCP, 2x1GbE, 2x10GbE, Cloud Integration, 1YR H/W Maintenance, Lifetime Basic Support. Contact VDS for additional connectivity options. EVO 2U 8 Bay SAN & NAS Server plus ShareBrowser Media Asset Management 64TB 8x8TB SATA, Unlimited ShareBrowser Licenses, Project Sharing for Avid/Adobe/FCP, 2x1GbE, 2x10GbE, Cloud Integration, 1YR H/W Maintenance, Lifetime Basic Support. Contact VDS for additional connectivity options. EVO 4U/18" Depth 8 Bay SAN & NAS Server plus ShareBrowser Media Asset Management 16TB 8x2TB SATA, Unlimited ShareBrowser Licenses, Project Sharing for Avid/Adobe/FCP, 2x1GbE, 2x10GbE, Cloud Integration, 1YR H/W Maintenance, Lifetime Basic Support. Contact VDS for additional connectivity options. EVO 4U/18" Depth 8 Bay SAN & NAS Server plus ShareBrowser Media Asset Management 32TB 8x4TB SATA, Unlimited ShareBrowser Licenses, Project Sharing for Avid/Adobe/FCP, 2x1GbE, 2x10GbE, Cloud Integration, 1YR H/W Maintenance, Lifetime Basic Support. Contact VDS for additional connectivity options. EVO 4U/18" Depth 8 Bay SAN & NAS Server plus ShareBrowser Media Asset Management 64TB 8x8TB SATA, Unlimited ShareBrowser Licenses, Project Sharing for Avid/Adobe/FCP, 2x1GbE, 2x10GbE, Cloud Integration, 1YR H/W Maintenance, Lifetime Basic Support. Contact VDS for additional connectivity options. EVO Desktop Prodigy SAN & NAS Server plus ShareBrowser Media Asset Management 8TB 4x2TB SATA, Unlimited ShareBrowser Licenses, Quiet Desktop Chassis, Project Sharing for Avid/Adobe/FCP, 2x1GbE, Cloud Integration, 1YR H/W Maintenance, Lifetime Basic Support. EVO Desktop Prodigy SAN & NAS Server plus ShareBrowser Media Asset Management 16TB 4x4TB SATA, Unlimited ShareBrowser Licenses, Quiet Desktop Chassis, Project Sharing for Avid/Adobe/FCP, 2x1GbE, Cloud Integration, 1YR H/W Maintenance, Lifetime Basic Support. EVO Desktop Prodigy SAN & NAS Server plus ShareBrowser Media Asset Management 24TB 4x6TB SATA, Unlimited ShareBrowser Licenses, Quiet Desktop Chassis, Project Sharing for Avid/Adobe/FCP, 2x1GbE, Cloud Integration, 1YR H/W Maintenance, Lifetime Basic Support. EVO Desktop Prodigy SAN & NAS Server plus ShareBrowser Media Asset Management 32TB 4x8TB SATA, Unlimited ShareBrowser Licenses, Quiet Desktop Chassis, Project Sharing for Avid/Adobe/FCP, 2x1GbE, Cloud Integration, 1YR H/W Maintenance, Lifetime Basic Support. EVO 1U Prodigy (Rackable) SAN & NAS Server plus ShareBrowser Media Asset Management 4TB 4x1TB SATA, Unlimited ShareBrowser Licenses, Project Sharing for Avid/Adobe/FCP, 2x1GbE, Cloud Integration, 1YR H/W Maintenance, Lifetime Basic Support. EVO 1U Prodigy (Rackable) SAN & NAS Server plus ShareBrowser Media Asset Management 8TB 4x2TB SATA, Unlimited ShareBrowser Licenses, Project Sharing for Avid/Adobe/FCP, 2x1GbE, Cloud Integration, 1YR H/W Maintenance, Lifetime Basic Support. EVO 1U Prodigy (Rackable) SAN & NAS Server plus ShareBrowser Media Asset Management 4TB SSD 4x1TB SSD, Unlimited ShareBrowser Licenses, Project Sharing for Avid/Adobe/FCP, 2x1GbE, Cloud Integration, 1YR H/W Maintenance, Lifetime Basic Support. 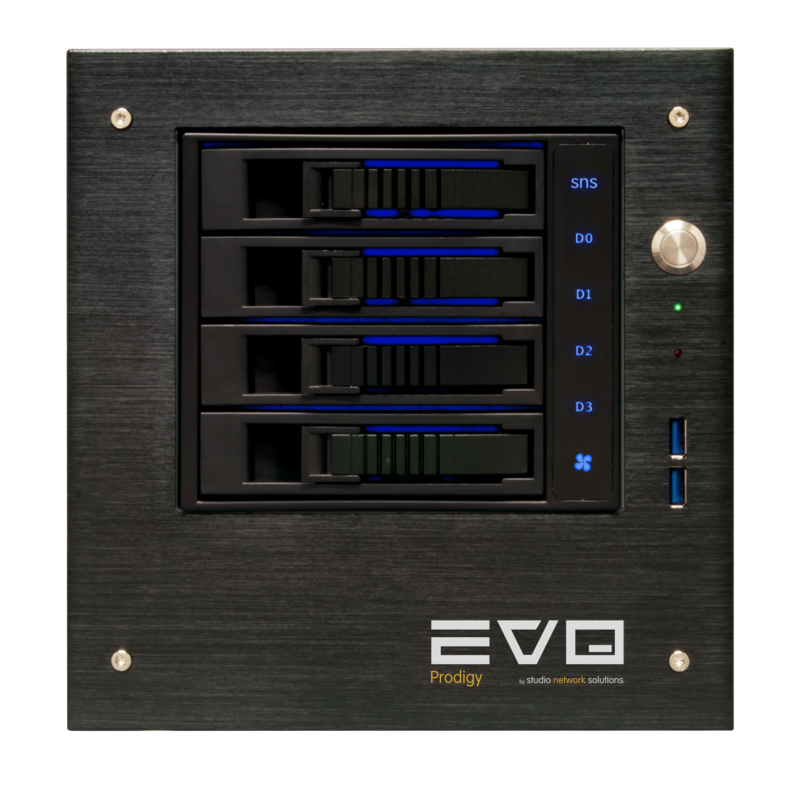 EVO 1U Prodigy (Rackable) SAN & NAS Server plus ShareBrowser Media Asset Management 8TB SSD 4x2TB SSD, Unlimited ShareBrowser Licenses, Project Sharing for Avid/Adobe/FCP, 2x1GbE, Cloud Integration, 1YR H/W Maintenance, Lifetime Basic Support. EVO 3U Nearline Storage SAN & NAS Server plus ShareBrowser Media Asset Management 32TB 16x2TB SATA, Disk Based Backup, Unlimited ShareBrowser Licenses, Optimized for High Speed Transfers, 2x1GbE, Cloud Integration, 1YR H/W Maintenance, Lifetime Basic Support. EVO 3U Nearline Storage SAN & NAS Server plus ShareBrowser Media Asset Management 64TB 16x4TB SATA, Disk Based Backup, Unlimited ShareBrowser Licenses, Optimized for High Speed Transfers, 2x1GbE, Cloud Integration, 1YR H/W Maintenance, Lifetime Basic Support. EVO 3U Nearline Storage SAN & NAS Server plus ShareBrowser Media Asset Management 96TB 16x6TB SATA, Disk Based Backup, Unlimited ShareBrowser Licenses, Optimized for High Speed Transfers, 2x1GbE, Cloud Integration, 1YR H/W Maintenance, Lifetime Basic Support. EVO 3U Nearline Storage SAN & NAS Server plus ShareBrowser Media Asset Management 128TB 16x8TB SATA, Disk Based Backup, Unlimited ShareBrowser Licenses, Optimized for High Speed Transfers, 2x1GbE, Cloud Integration, 1YR H/W Maintenance, Lifetime Basic Support. EVO 3U Expansion Chassis for 16 Bay and 8 Bay 32TB 16x2TB SATA, Easily Grow Existing Pools, 4x Max Expansions for 16 Bay (80 Disk), 1x Max Expansions for 8 Bay (24 Disk), 1YR H/W Maintenance. EVO 3U Expansion Chassis for 16 Bay and 8 Bay 64TB 16x4TB SATA, Easily Grow Existing Pools, 4x Max Expansions for 16 Bay (80 Disk), 1x Max Expansions for 8 Bay (24 Disk), 1YR H/W Maintenance. EVO 3U Expansion Chassis for 16 Bay and 8 Bay 96TB 16x6TB SATA, Easily Grow Existing Pools, 4x Max Expansions for 16 Bay (80 Disk), 1x Max Expansions for 8 Bay (24 Disk), 1YR H/W Maintenance. EVO 3U Expansion Chassis for 16 Bay and 8 Bay 128TB 16x8TB SATA, Easily Grow Existing Pools, 4x Max Expansions for 16 Bay (80 Disk), 1x Max Expansions for 8 Bay (24 Disk), 1YR H/W Maintenance.